Share some love this St. Patrick's Day with this Kiss Me I'm Irish Dog Shirt in Green! 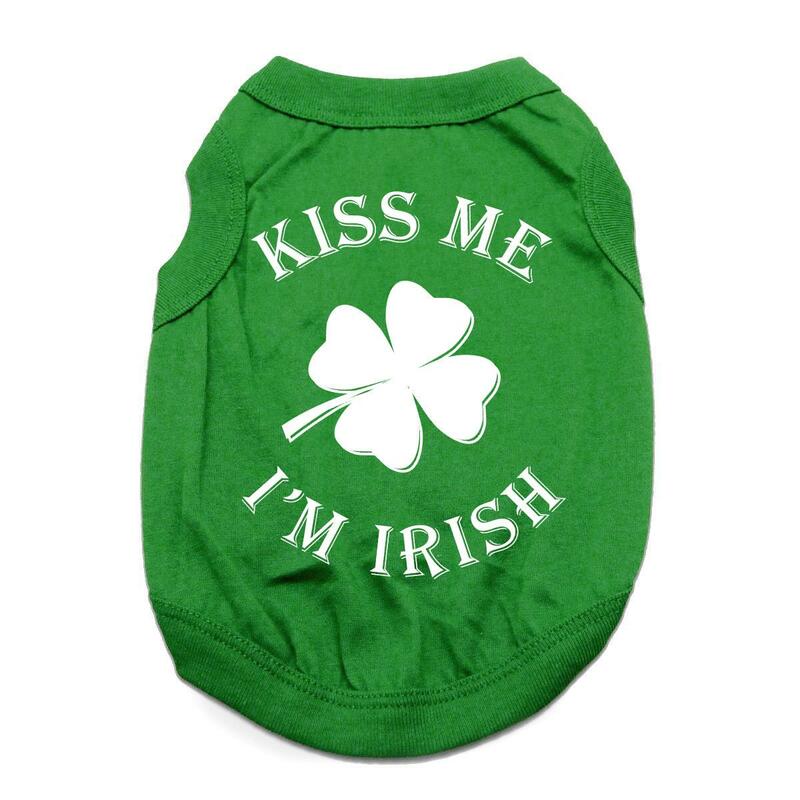 The Kiss Me I'm Irish Dog Shirt will bring out smiles and smooches during your outings and this holiday season! This dog t-shirt features a high-cut, stay-dry belly for ultimate comfort and convenience. Design screen-printed on this easy-care soft knit is made of 100% cotton. Machine wash cold and dry flat for best results. Great for a gift! 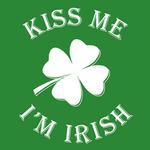 Kiss Me I'm Irish Dog Shirt - Green Customer Photos - Send us your photo! Walter is excited to sport his new outfit at work next week and see how many lucky kisses he can get. Who isn't Irish for St Pattys Day? Higgy loves to wear shirts. He gets hard to catch a good picture due to his color and the need to never sit still. This picture turned out good.... My Little Leprechaun! Higgy loves to wear clothes. He absolutely adores his new "Kiss me I'm Irish" shirt. You can tell by his sweet poses. Posted On 03/28/18 by Margo C from Phoenix, AZ Yes, Margo C recommends this product! A must have for Irish (and wanna-be Irish) fur babies. My puppy looks adorable in this and receives many compliments. Posted On 03/21/18 by sheila G from Chatham, LA Yes, sheila G recommends this product! Mo is my little dog and he loves his new t-shirt.Him and Sofia looks like twins in their shirts. Posted On 03/09/18 by Courtney B from Spokane, WA Yes, Courtney B recommends this product! My dog looks so cute in this shirt. The fit is great and it's good quality. Posted On 02/15/18 by Tanya K from Milwaukee, WI Yes, Tanya K recommends this product! I can't wait for St. Patricks Day to put this on my pup. It seems well made and I love the vibrant green color. It looks great on my Brindle Boston Terrier. I ordered a medium which fits him perfectly. Posted On 03/18/17 by michael p from Harmony, PA Yes, michael p recommends this product! Posted On 03/17/17 by Patricia D from Phoenix, AZ Yes, Patricia D recommends this product! Posted On 02/19/17 by Kristina P from Sandy Hook, VA Yes, Kristina P recommends this product! I love the sweatshirts and sweaters! We bought 2 hoodies and 2 sweaters. All of which were great quality. I tried store after store and no where else has a better selection at great prices!